Innovative Integration (Pvt.) Ltd is one of the leading solutions provider specialized in Network Security, System Infrastructure, Application Delivery Optimization, Data Center, Storage and Data Protection in Pakistan. Innovative Integration, the Pakistan leading system integrated specialist and a Symantec partner, helped Bank Islami deployed NetBackup and ensure that they had a scalable, high performance, data protection architecture for the banks Linux environment. Their environment includes more than 100 HP servers and a centralized pool of network appliance storage. 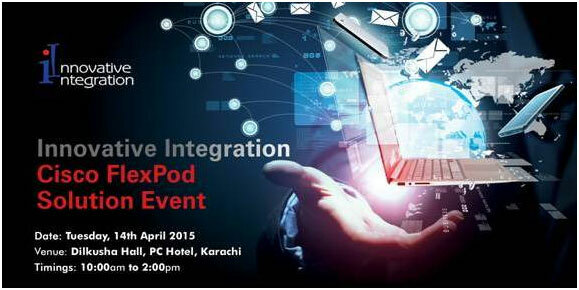 Innovative Integration proudly launched first Cisco FlexPod in Pakistan on 14th- April- 2015. The launching ceremony held at PC Hotel, Karachi Pakistan. Cisco Data Center Event with innovative Integration Tuesday, 23rd January, 2018 Heena Hall, Pc Hotel, Karachi. notification of our new post & features by email. © 2019 Innovative Integration (Pvt) Limited.